We prepare teaching programmes for beginners and advanced. Snowparks and jumps for advanced clients. Special lessons for children. According to your current skills you can choose a group from begginers to an improving your style. 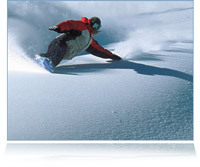 We provide10% discount for reservation of ski - snowboards lessons and rental on-line. Please order groups of 9-12 persons, only if you have a full group of at least 9 people. Group lessons of ski or snowboard starts on Sunday at 10 am. Registration in groups during the week is possible after arrangement. Compact groups can begin during the week. Group lessons: 10,00 – 11,50 and 14,00 – 15,50. Private lessons: 9,00 – 16,00. Prices are calculated in CZK per a person and an hour or per a day. Prices in EUR are according to actual exchange. Teaching is in groups max. 8 persons. Helmets rentals are includet in all packets free of charge. Helmets are not compulsory for adults. Prices are calculated in CZK. Prices in EUR are according to actual exchange.